If Scotch were made in the Caribbean, it’d be called Añejo whisky. Añejo means “aged” in Spanish and is most typically used in the naming of tequila, which is made from blue agave. It’s not, however, the only spirit that is aged. Brugal & Co., owned by Edrington Group (which also owns my favorites The Famous Grouse, The Macallan, and Highland Park), produces aged rum in the Dominican Republic. 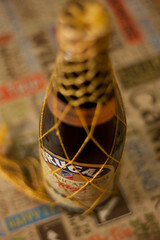 Until recently, you couldn’t get Brugal rum in the United States, despite being made so close to our shores. So why are we talking about rum on a site called Scotch Addict? Brugal Rum is best enjoyed in the same manner as scotch, neat or with a single ice cube. There are three main expressions – Brugal Rum Blanco Especial, Brugal Rum Añejo, and Brugal Rum Extra Viejo. The Blanco Especial is aged 12-16 months in American oak casks, the Añejo is aged 3-5 years, and the Extra Viejo is aged 5-8 years. It’s the Extra Viejo that is best enjoyed neat or over ice. Brugal recommends that the Añejo be paired with fresh lime juice and a Lemon-lime soda, which sounds absolutely fabulous on these hot summer days. Pour the rum over ice in a tall glass, add a squeeze of fresh lime juice, and then fill with lemon lime soda. I’m all about trying different spirits and why go with any old rum when you can enjoy one made in the Dominican Republic? Mmmmm… I can’t wait to give this a try. This entry was posted in Tasting Notes and tagged Brugal, Rum by Jim. Bookmark the permalink.